After efforts to encourage the now-infamous "Upstate S.C. elk" to return to its home herd in North Carolina proved unsuccessful, the animal has been relocated to the S.C Department of Parks, Recreation and Tourism's Charles Towne Landing State Historic Site, where it will become a part of the "Animal Forest" exhibit there. The now-infamous wandering elk that visited rural neighborhoods in the Upstate of South Carolina during November has found a new home as part of an exhibit of Colonial-era wildlife at the S.C. Department of Parks, Recreation and Tourism's Charles Towne Landing State Historic Site. It is being held temporarily in a quarantine pen until SCPRT officials determine it can be safely released into the "Animal Forest" at CTL. 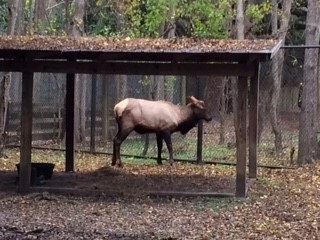 However, it will be some time before visitors to Charles Towne Landing will be able to see the elk, say SCPRT officials. It will remain under observation in a quarantine pen under until it is determined that it is safe for it to join the other animals in the exhibit area. People began spotting the young bull elk, estimated by SCDNR biologists to weigh about 500 pounds, in late October at various spots in Pickens County. Biologists believe the young bull elk was pushed away from his home territory in Haywood County, N.C., by larger bulls. Despite repeated warnings not to approach or feed the elk, word of the rare visitor quickly spread on social media, and photos and video of people doing just that began to circulate. "This elk is a wild animal and not domesticated," said S.C. Department of Natural Resources wildlife biologist Tammy Wactor. "It has become accustomed to people, so it will allow people to approach it, but it is unpredictable, and this behavior can create dangerous situations." In order to protect the elk (and the public), biologists from the SCDNR and the N.C. Wildlife Resources Commission eventually relocated it to a remote part of the mountains in Oconee County. When the elk then moved on its own to a spot near Devils Fork State Park, biologists were hopeful that it might keep moving north and rejoin the herd, but unfortunately, that didn't happen. "The elk was tranquilized Friday morning, (December 16) in a neighborhood south of Devils Fork State Park in Oconee County," said Wactor. "It had been in this neighborhood for the past two weeks, and did not show any sign of moving. It had become more aggressive and was showing no sign of going back to North Carolina. SCDNR biological staff decided it was time to move it, and Charles Towne Landing was willing to accept the animal." According to information on the Charles Towne Landing website, the Animal Forest is unlike most zoos. While the animals are still the attraction, their ties to the history of Colonial South Carolina is the lesson. The exhibit is home to a variety of species that inhabited the Carolinas at the time when Charles Towne was a newly settled English colony. Through informational signs along the paved trail through the exhibit, visitors are "reminded of the challenges faced by those pioneers, of daily life in a wild world, of predators and prey... as you walk the trail, you can imagine life this way and how each of the animals in the zoo played a role in the lives of the colonists." Elk were present in the mountains of the Carolinas and other southeastern states at the time of European colonization, but by the 1800s, overhunting and loss of habitat led to their disappearance. Elk were reintroduced to the Great Smoky Mountains National Park in 2001, and that herd has grown to approximately 150 animals. Legislation passed in 2009 by the S.C. General Assembly protects elk in the Palmetto State, in anticipation that they might eventually begin to show up here.